Koba Entertainment announced a brand new live, interactive and family-friendly stage show visiting 38 western Canadian cities in 2016. 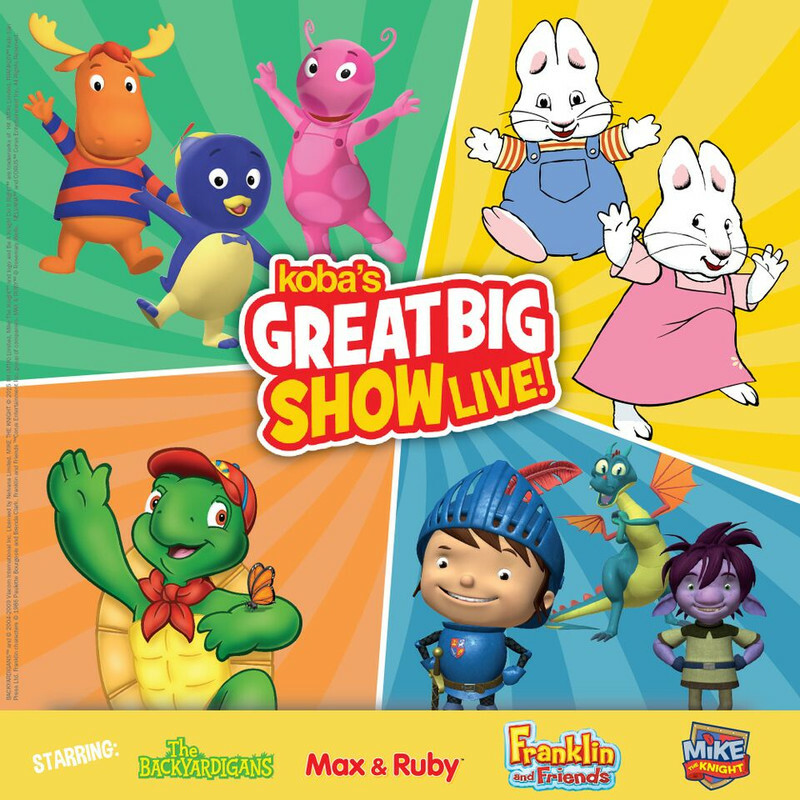 “Koba’s The Great Big Show” is the company’s first-ever live family theatrical tour that features lovable and endearing characters from four of the top-rated preschool shows on television today. Starring Franklin the Turtle, a Canadian icon in children’s entertainment for more than 20 years, as well as The Backyardigans, Max & Ruby and Mike the Knight, the all star cast will perform original, interactive songs for families kicking off January 23 in Manitoba. Adapting iconic characters from the animated screen to the live stage, is a professional challenge that continues to inspire and drive Koba’s entire creative production team. “With more than 25 costume and character changes, this mega-production promises to keep the entire cast, crew and audiences on their toes,” says Caplette. In “Koba’s The Great Big Show,” families embark on a musical adventure that encompasses Koba’s most popular stage productions. The imaginative Backyardigans travel from the frozen north to the sunny seas and home again just in time for a snack. “Hilarious results arise when everybody’s favourite bunny siblings Max & Ruby encounter strange party guests,” says Caplette. Fans will also have fun playing riddles and rhymes with Franklin the Turtle and his Woodland pals. They’ll also join the chivalrous Mike the Knight and his friends on adventures in the magical kingdom of Glendragon. For more information, visit www.GreatBigShowOnTour.com.